Acrylic knit & fleece lining:Made of thicker and cozy acrylic knit with soft fleecy lining, enjoy comfortable and warm. Free size:Stretchy and elastic.Head circumference56-58cm/22\"-22.8\".Unisex size fits most men and women. Healthy and Comfortable, Anti Pilling, Wind Resistance, Wrinkle Resistance. 2-in-1 winter accessories: You can use this multi-function beanie hat and scarf set together or separately as you will.Bring you warm, cozy and stylish. 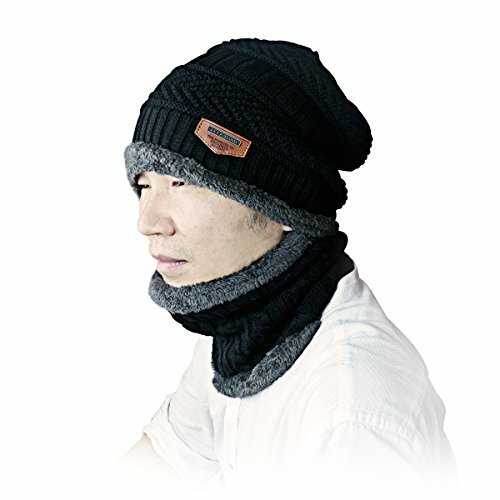 Head and Neck protection:Stay warm all the time.Great for outdoor activities and daily warmer.